Audio Space AS-3i Vacuum Tube Integrated Amplifier. Audio Space AS-3i is one of the most popular models among the integrated amplifiers within the AUDIO SPACE family, especially for audiophiles with the more refined taste for music. It uses 4 pcs of EL34 plus 2 12AU7 and a and a 12AX7. It packs enough power to drive most floor-standers and bookshelf speakersand yet retains the smoothness and details for the most discriminate ones. Dimension (DxWxH) : (328 x 298 x 188) mm Weight: 16kg Input Impedance: > 100Kohm (RCA) Output Impedance: 4, 8 ohm Output Power: 32Wx2 Class AB2 P-P (Ultralinear) 16Wx2 Class AB2 P-P (Triode) Damping Factor: > 5 Frequency Response: 20Hz - 30KHz / -1dB T. Output Total Gain: 30dB Input Sensitivity: 300mV-600mV S/N Ratio: > 89dB (Hum Noise < 3mV) Channel Balance: /- < 1dB 20Hz-20KHz Max. Volume Channel Separation: > 60dB (1KHz-3.3KHz) Tubes: 1 x 12AX7 (ECC83 or 4004), 2 x 12AU7 (ECC82 or 4003), 4 x EL34 Power supply: AC220V-240V. All items guaranteed brand new in the Box. 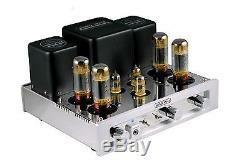 The item "Audio Space AS-3i Vacuum Tube Integrated Amplifier Brand New" is in sale since Monday, March 28, 2011. This item is in the category "Consumer Electronics\Vintage Electronics\Vintage Audio & Video\Vintage Amplifiers & Tube Amps".cn" and is located in China. This item can be shipped to United States, Canada, United Kingdom, Mexico, Germany, Japan, Australia.